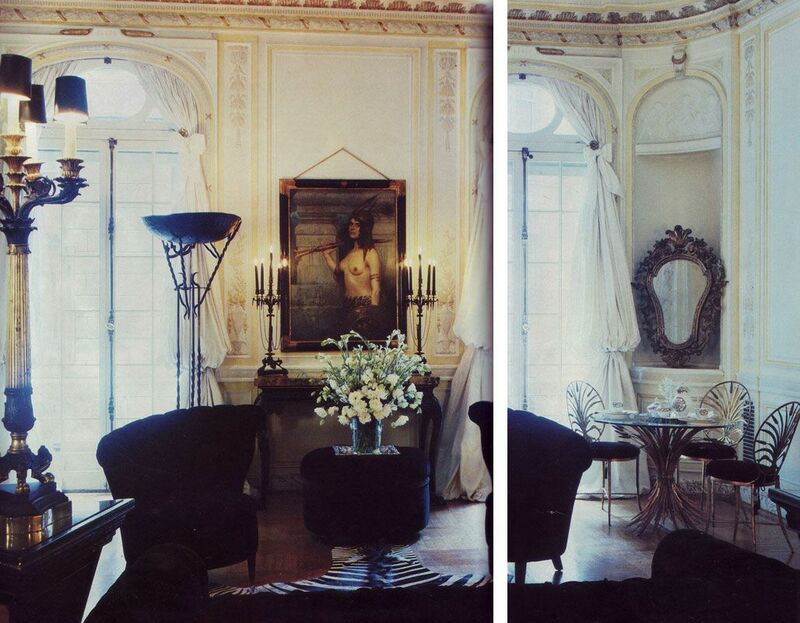 Is it just me, or does Norma Kamali's apartment in 1988 look an awful lot like her Spring/Summer 2010 collection of clothing? 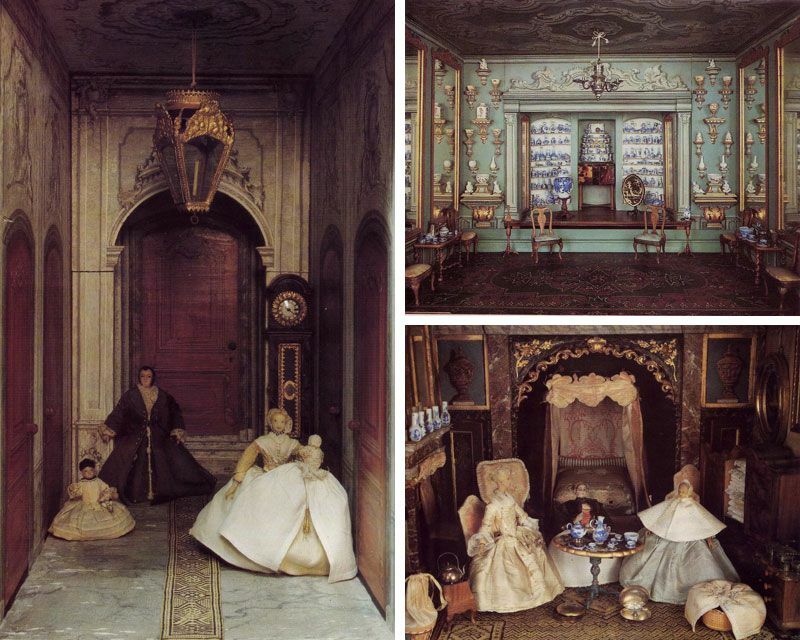 Sort of like the models teleported out of her ruched and ribboned residence, c. 21 years ago? 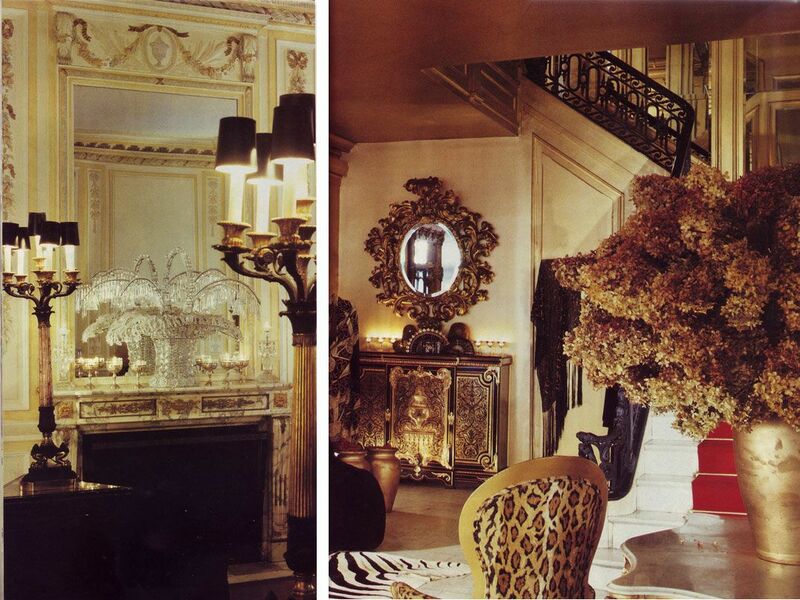 Love the leopard and zebra here— they give the apartment TEETH. And is that crystal bouquet another reference to Coco? 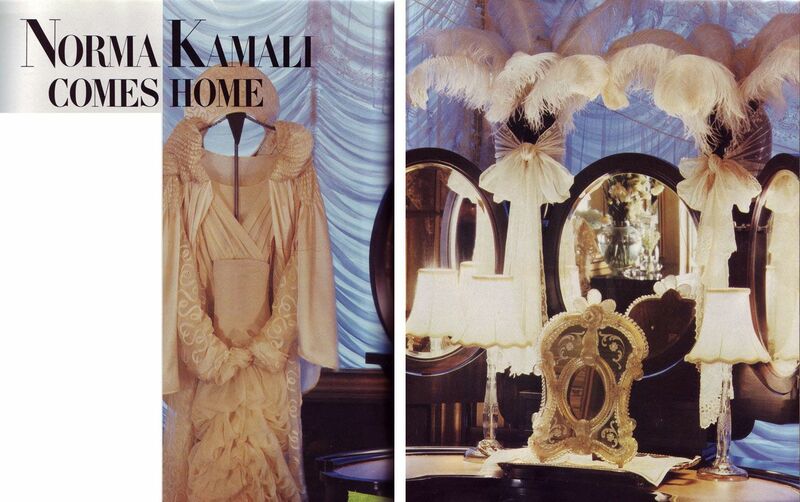 Norma Kamali's apartment, from House & Garden, December 1988. 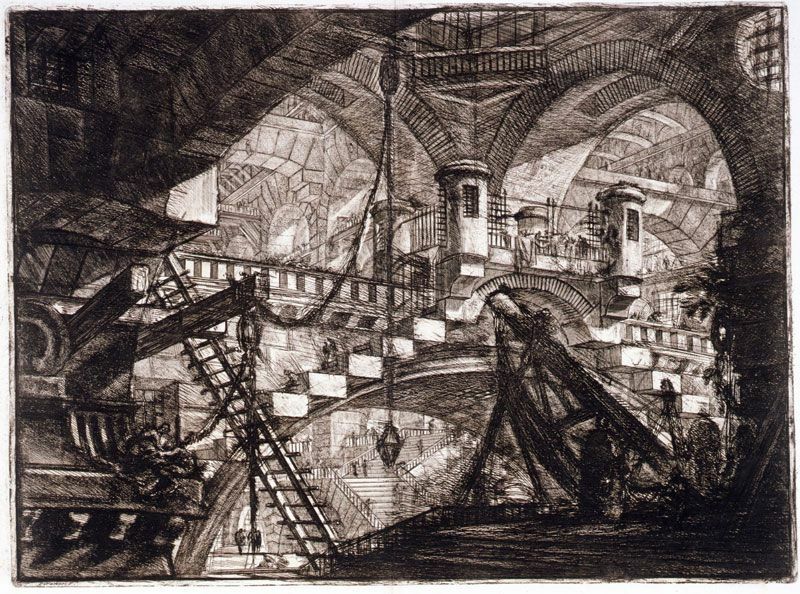 Venetian born artist Piranesi (1720-1778) may have been trained as a builder, but his greatest architectural feats exist in his engravings, scenes of fantastical architecture that he sold to tourists in Rome during his youth. 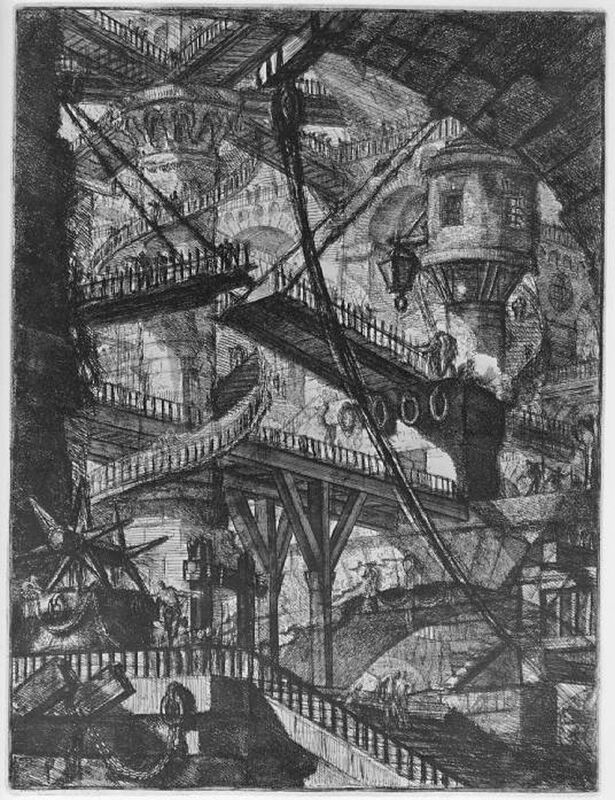 "Piranesi shows us that fantasy can have a more lasting impact than a concrete monument to the ego," says Nicolai Ouroussoff, from a New York Times piece on Piranesi. 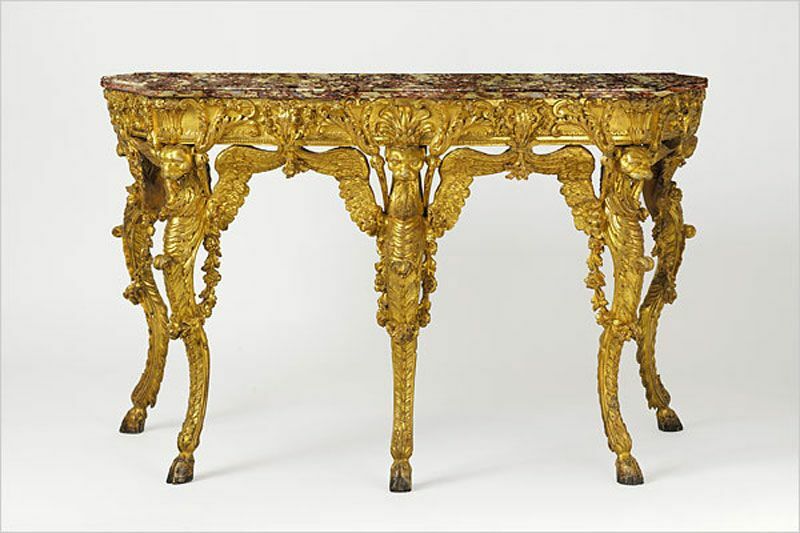 One of Piranesi's furniture designs. Image via New York Times. Now here's a man who is wholeheartedly committed to a view. I can respect that. I did some research of my own to get to the bottom of who this Elliott is, as it takes a special kind of individual to commit to a cemetery like this, right? 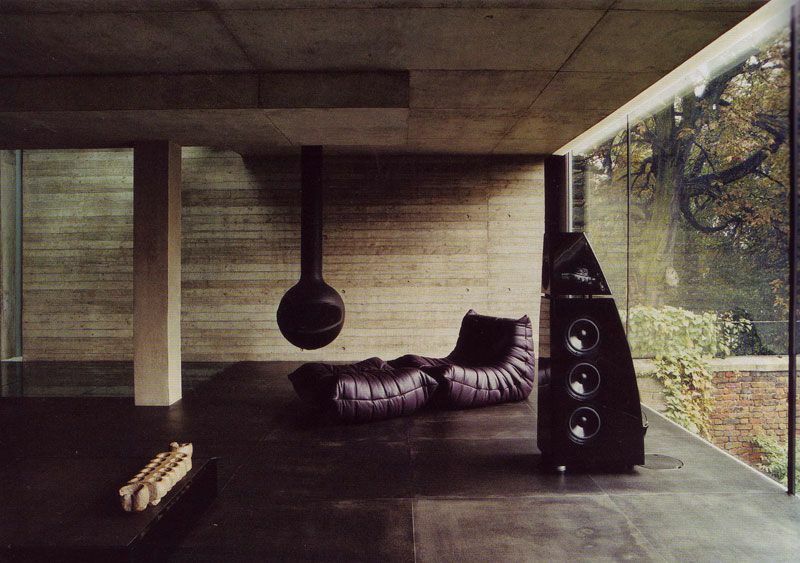 Apparently, he's a chartered surveyor and avid "music mixer" (DJ?) who lives in the house alone. 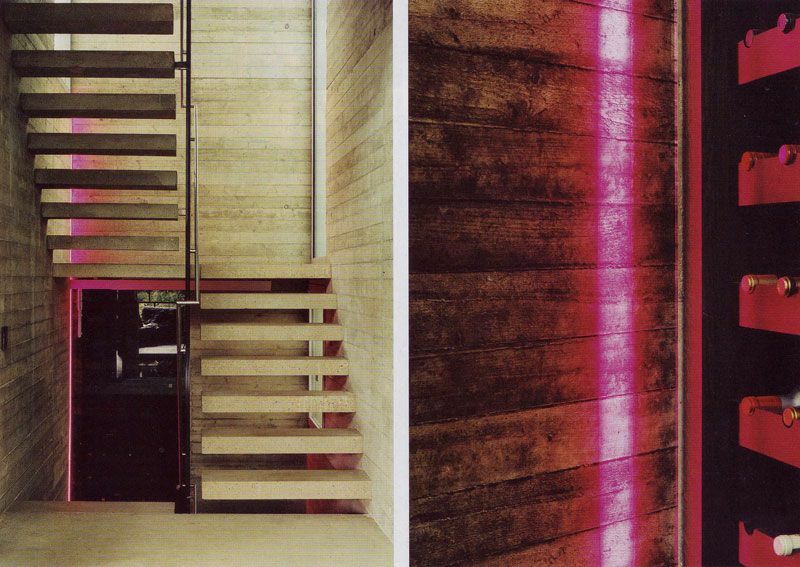 Maybe the DJing explains the bizarre clubby neon pink light in his stairwell (which I'm weirdly drawn to, for some reason). 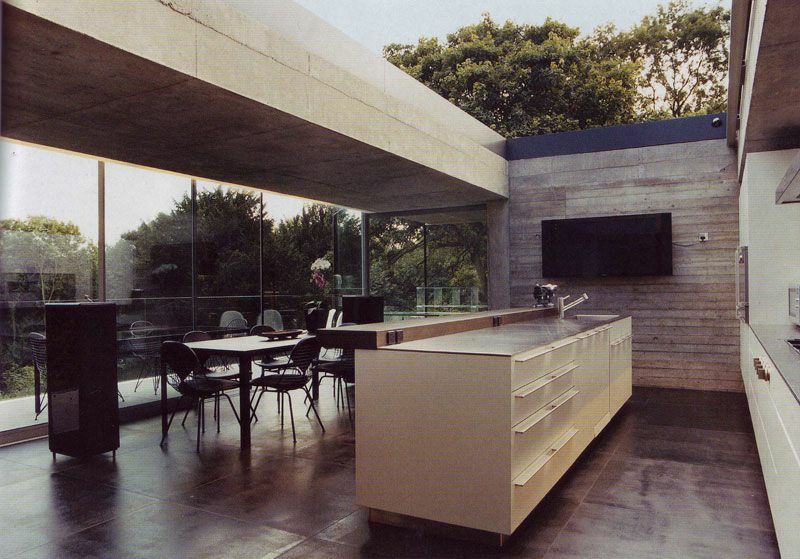 My question is: can you imagine living here? The cemetery is certainly central to the lifestyle promoted by this architecture, and I suppose that might be a problem for some, but for me, the real issue is the sparseness! As someone more comfortable surrounded with layers upon layers of STUFF, I'm always in awe of those who can live with minimalism, like Elliott, who has obviously chosen to do so as a way of emphasizing his most unusual plot of land. 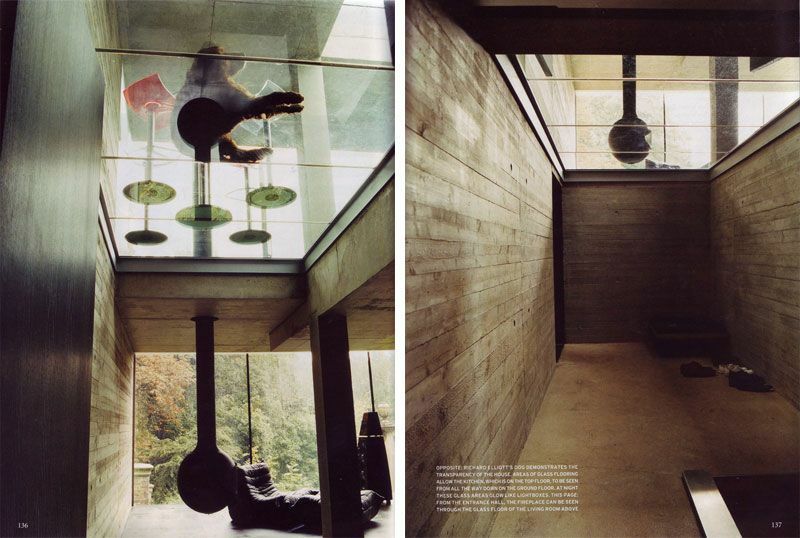 Scans from Graveyard Shift, World of Interiors, March 2009. 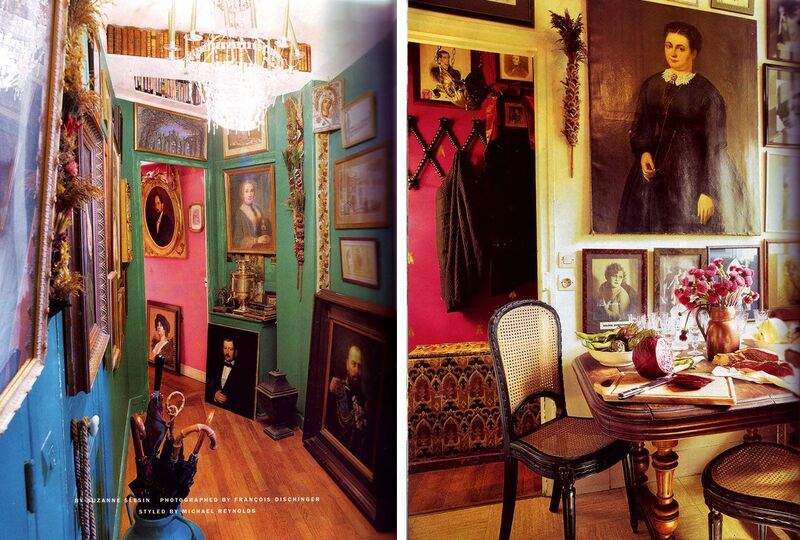 In June, British Vogue ran a piece on Plum Sykes's favorite pink accessories ("A Life in Pink"). 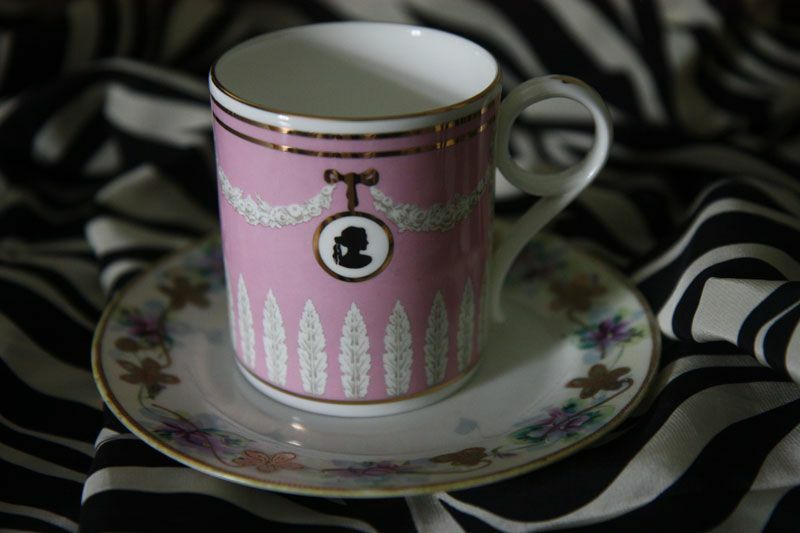 Amongst the pink stationary, pink flowers and pink macaroons (this woman isn't kidding about living la vie en rose) was a discontinued pink Wedgwood cameo archive mug. Anyway, for those of you who may be looking for it, I managed to track down the mug online through a UK shop, Needful Things . For what it's worth, they were extremely helpful with shipping, and very personable altogether. A Dream of A Dress? More like, a dream that my life would more closely resemble this photoshoot! 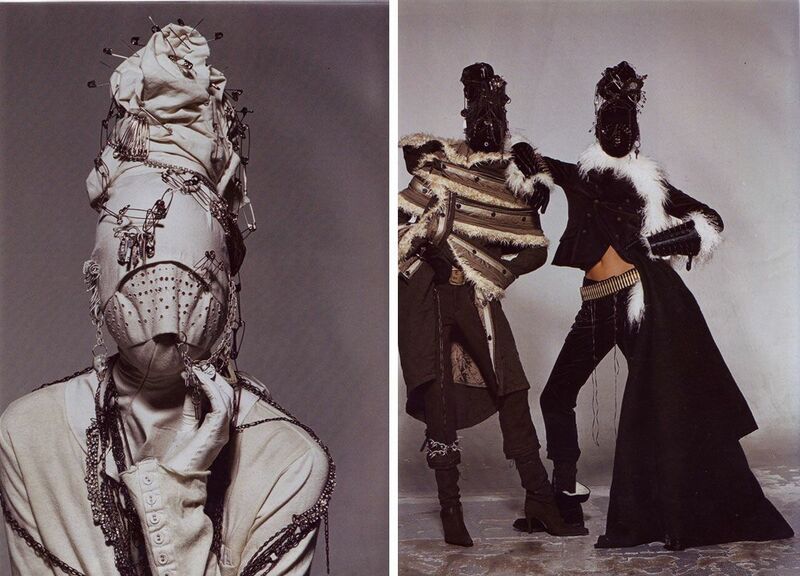 I realize that these shots from the September Vogue Italia Couture supplement are already out and about on the internet, but they were too jaw dropping not to share. 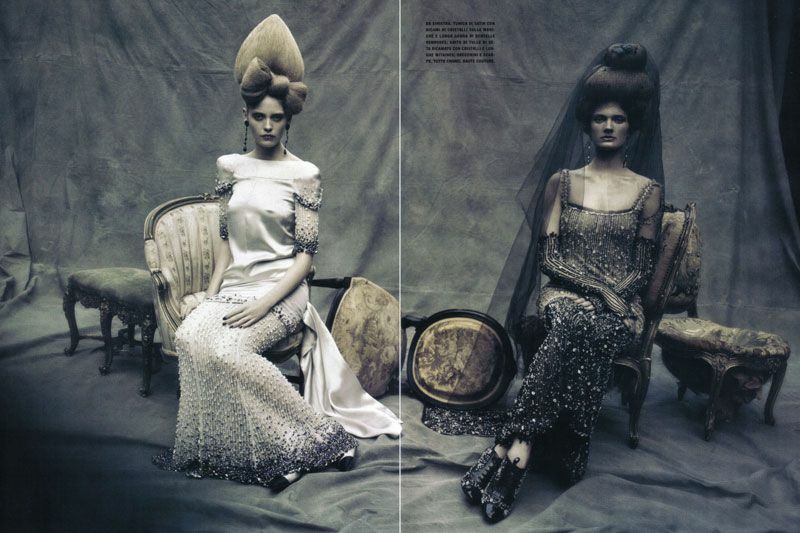 Vogue Italia never ceases to amaze. These are just a few of the best—the actual editorial is twice as long. I am ECSTATIC over the hair. 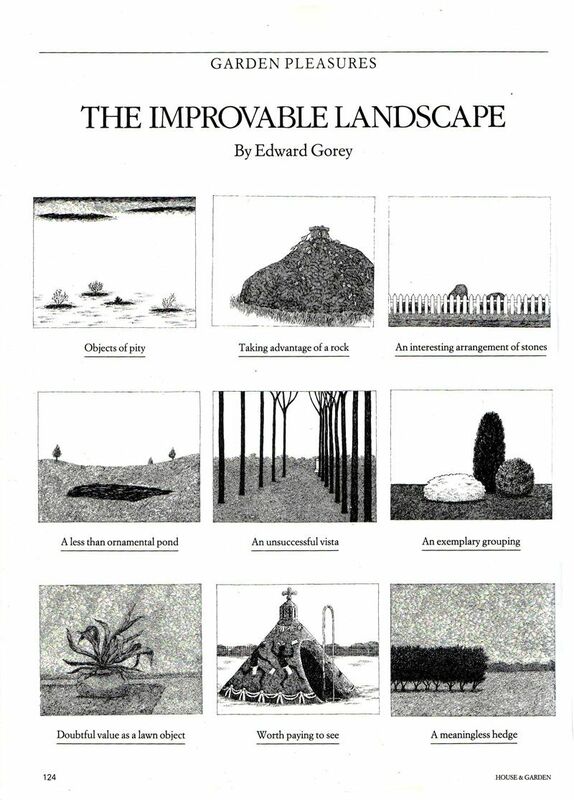 It makes me think of perfectly sculpted hedges and French formal gardens. 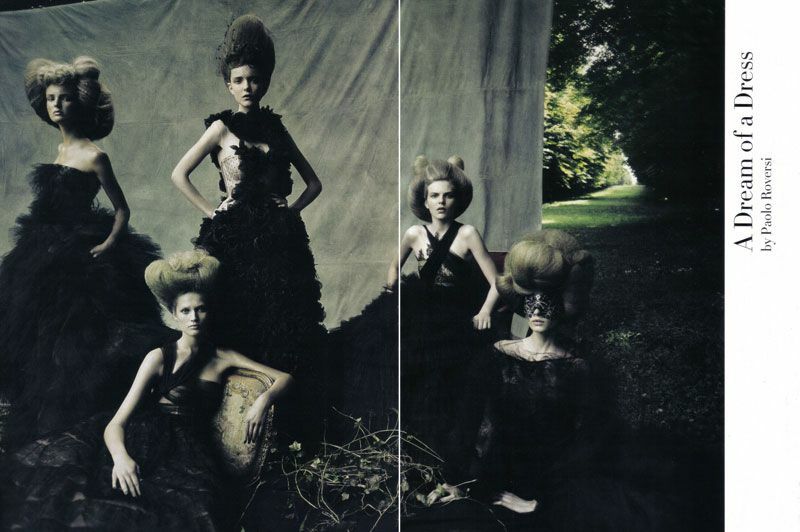 Or, alternately, ladies of the French court do sci-fi (Coneheads? Rocky Horror? I mean this in the best way, of course). 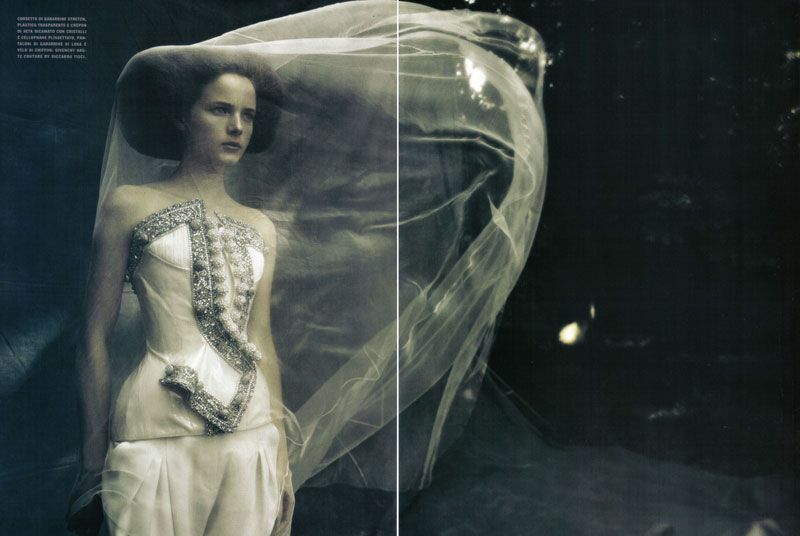 A Dream of a Dress, photographed by Paolo Roversi, Vogue Italia September 2009. 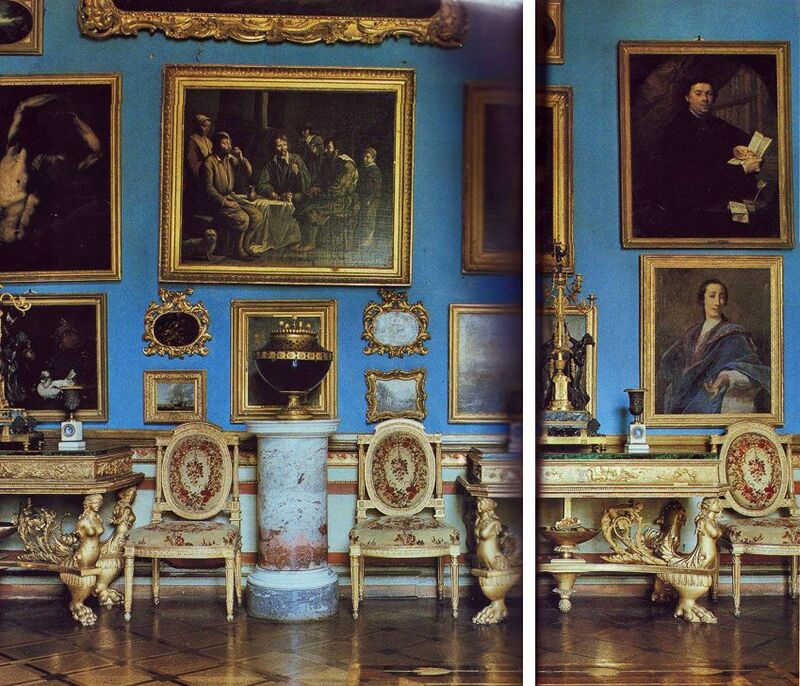 The inspiration for my latest piece came from: 1. 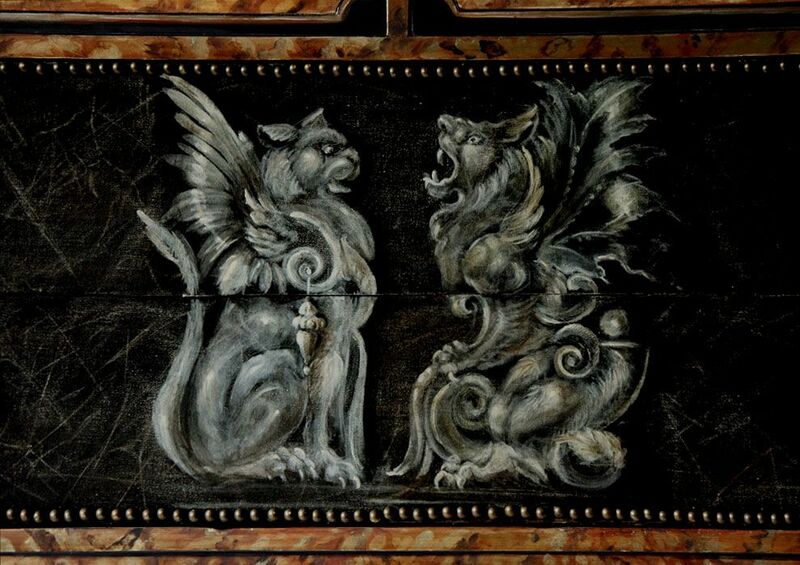 The mood set by 16th century grotesques, 2. an example of tortoise shell overlay on gold leaf, the result of which was a sort of metallicized tortoise, and 3. the idea of metallicized tortoise confronting a distressed, raw texture, almost leather-like in appearance. 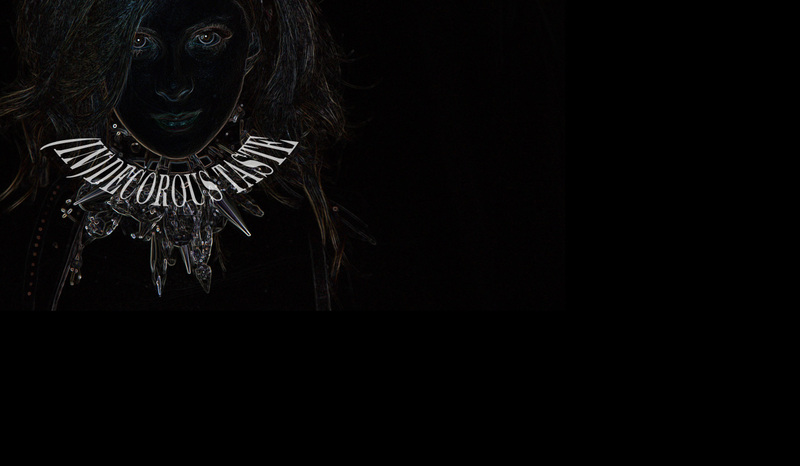 Disparate materials, organic by nature. The metallic tortoise is a deep, muted faux-tortoise accented with gold. 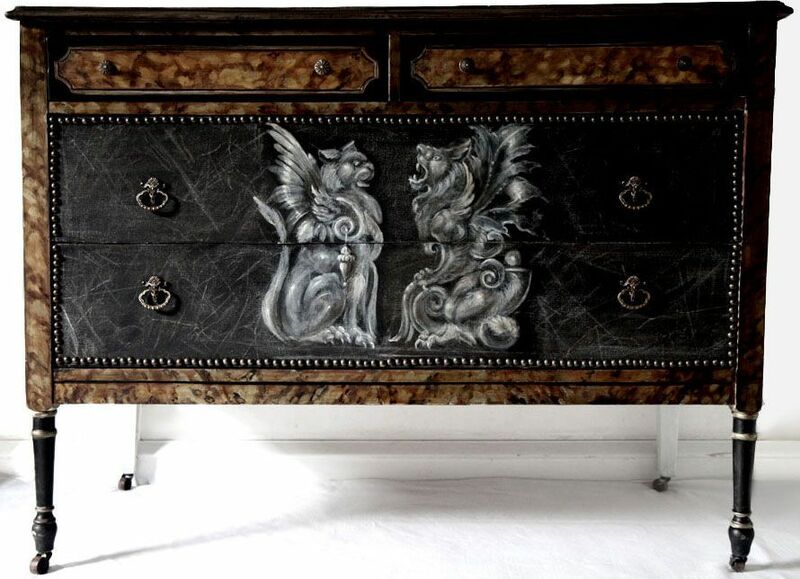 The large, textured drawers are covered in canvas that I treated, distressed, painted and mounted and accented with brass nailheads. 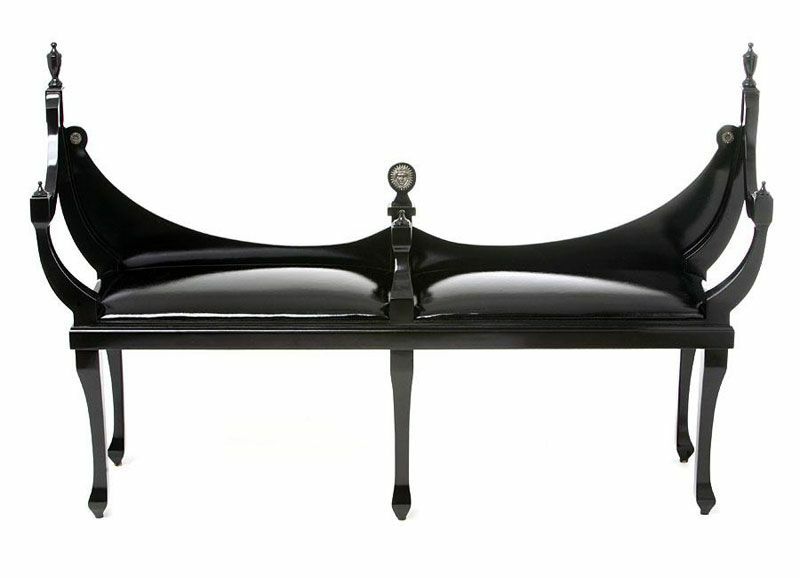 Created, styled, and photographed by (In)Decorous Taste. Click images to enlarge. 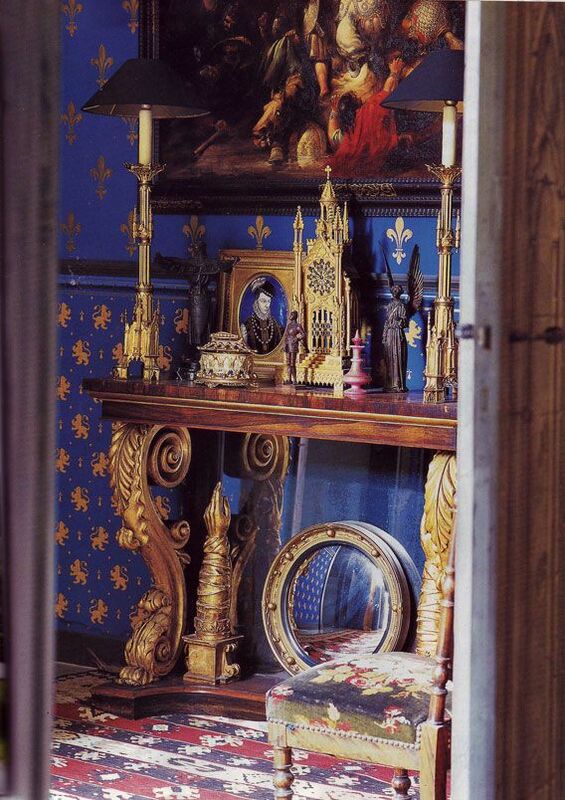 Pungent colors and jewel box rooms for all of you, who, like me, harbor dreams of living in a Fabergé egg. 3. 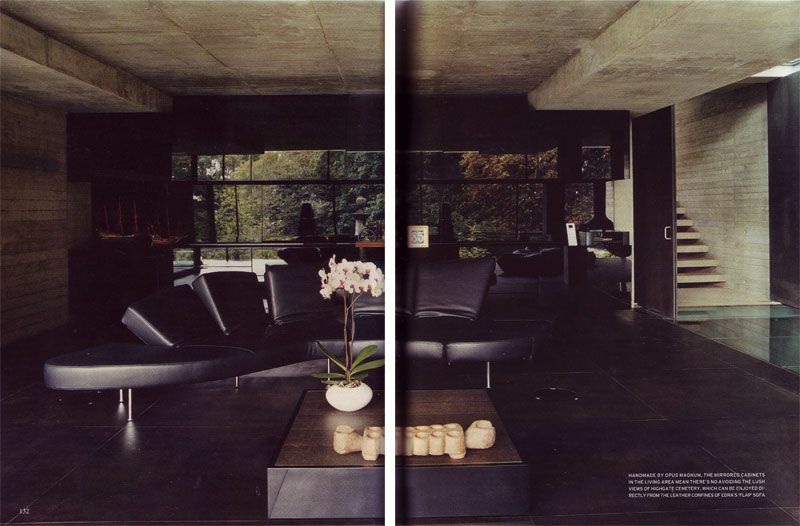 The Brussels home of designer Christophe Decarpentrie (House & Garden, 2000). You hear a lot about rooms with "great bone structure." This one has better bones than Kate Moss. 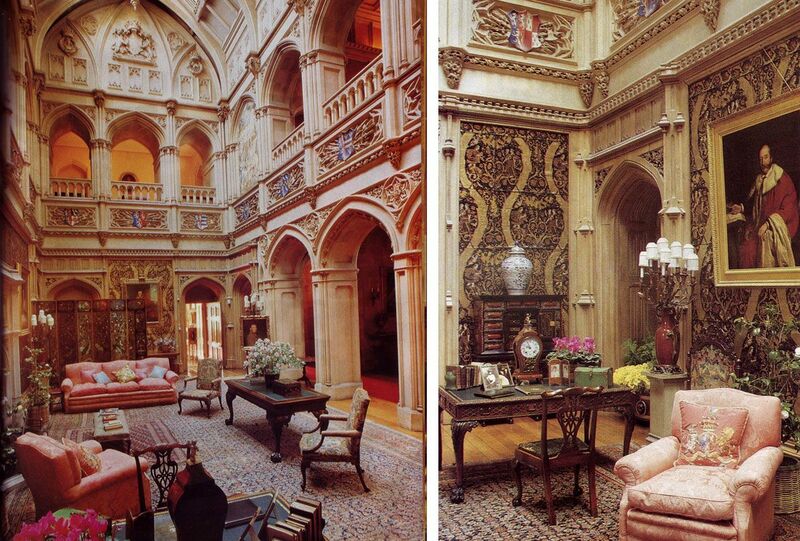 The great hall at Highclere Castle in Hampshire, designed by Thomas Allom. 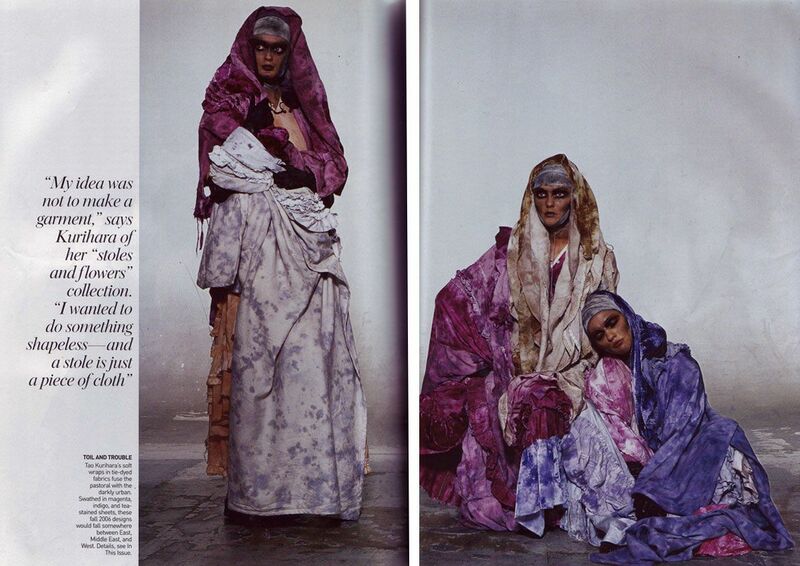 Scans from House & Garden, March 1989. 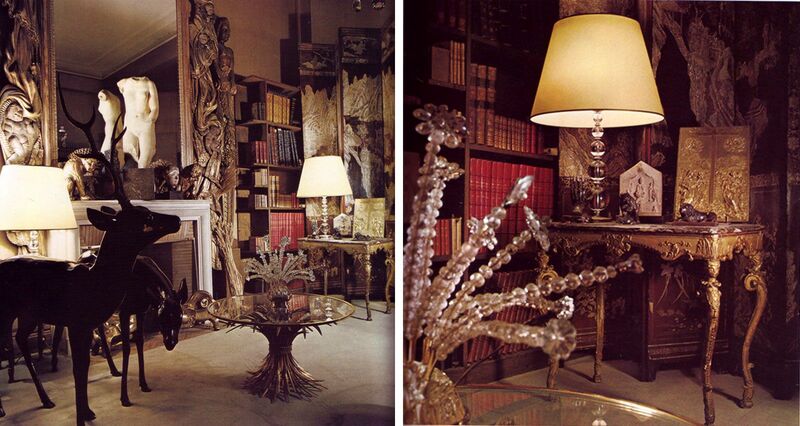 Yesterday, I referenced Coco Chanel's bouquet of crystal flowers. I don't know about you, but it drives me INSANE when there are written accounts of particularly beautiful things sans accompanying images. 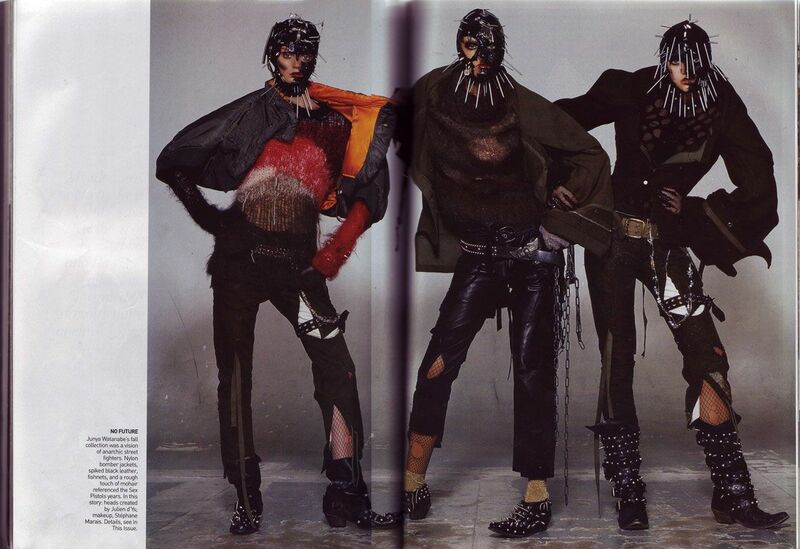 Take, for instance, Denning and Fourcade's legendary raccoon carpet, pieced together from old fur coats. 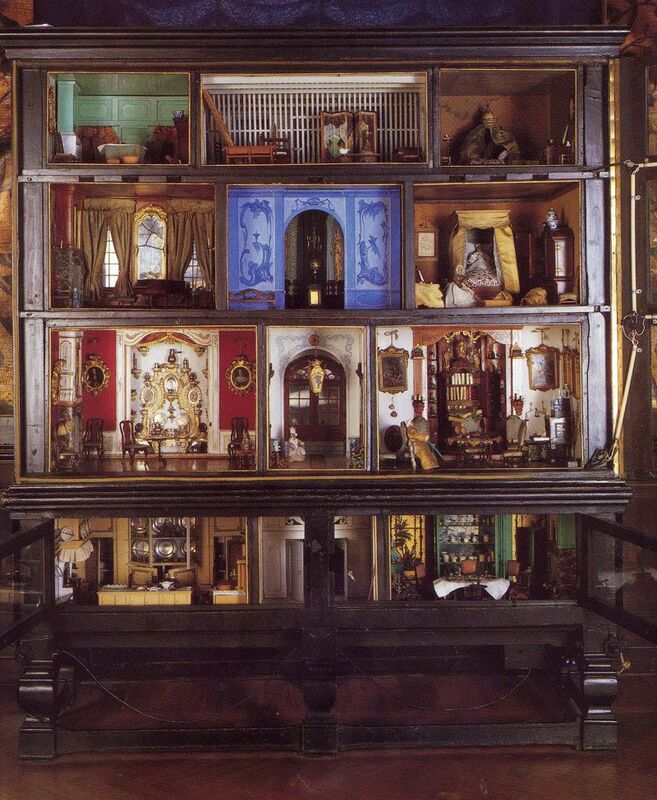 Only read about it, never seen it, and can't stop building it up in my head. 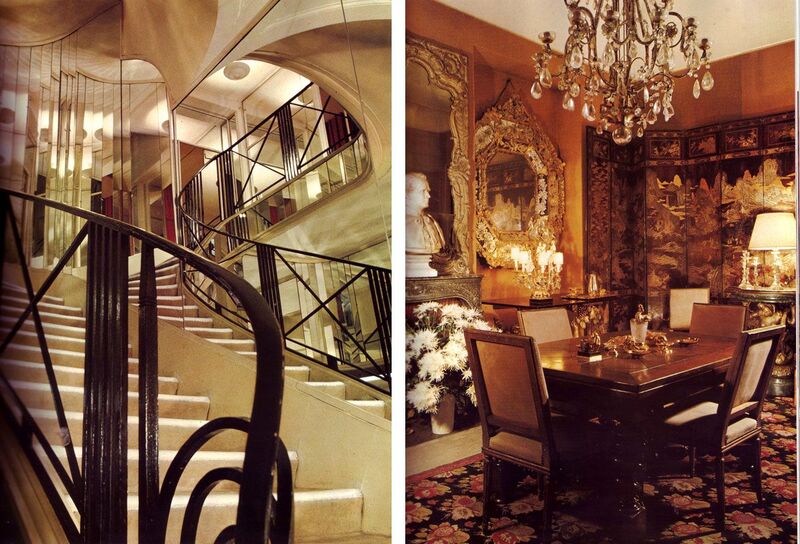 So, for the sake of sanity, here is Coco Chanel's Parisian apartment, on the 3rd floor at the House of Chanel, 31 rue Cambon. 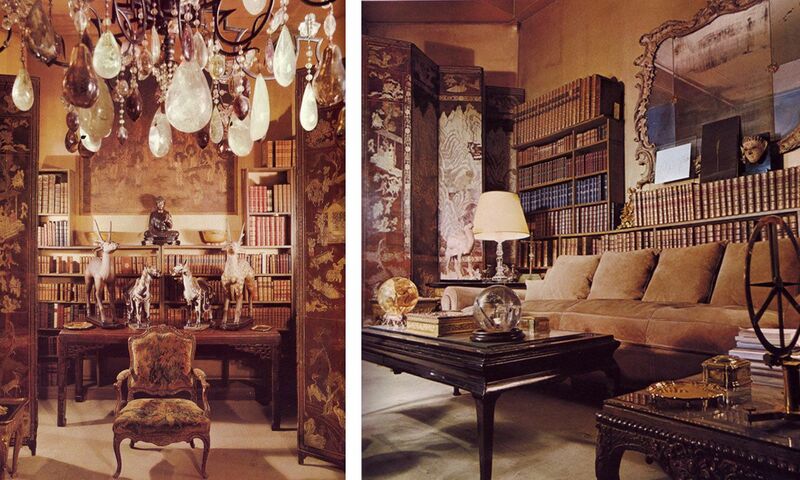 It's one of my absolute favorite interiors, full of loveliness in the form of rock crystal, aged metallics, huge sculptures, and bronze deer grazing in the living room. 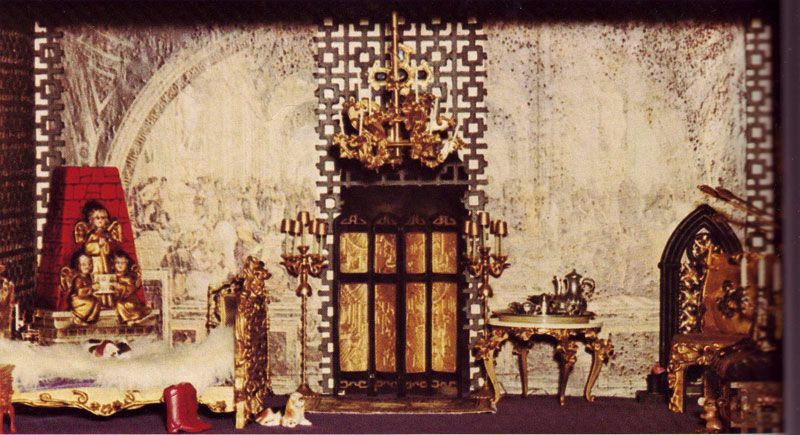 It seems that Ms. Chanel wasn't an antique snob either, only a snob for taste: While the marble torso on the mantel is a Greek 4th century BC Aphrodite, and the carvings surrounding the mantel are from an Italian church, the crystal flowers were from a flea market!! 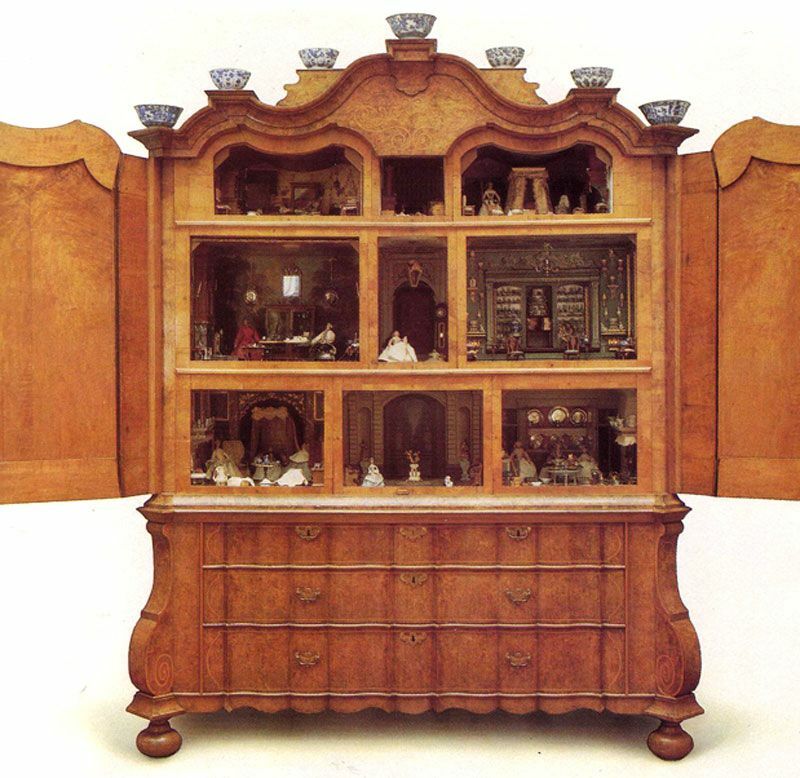 Hervé Mille also noted something to this effect in Architectural Digest's 1977 edition of Celebrity Homes: "She never bought anything she didn't like. She didn't buy because it was valuable. 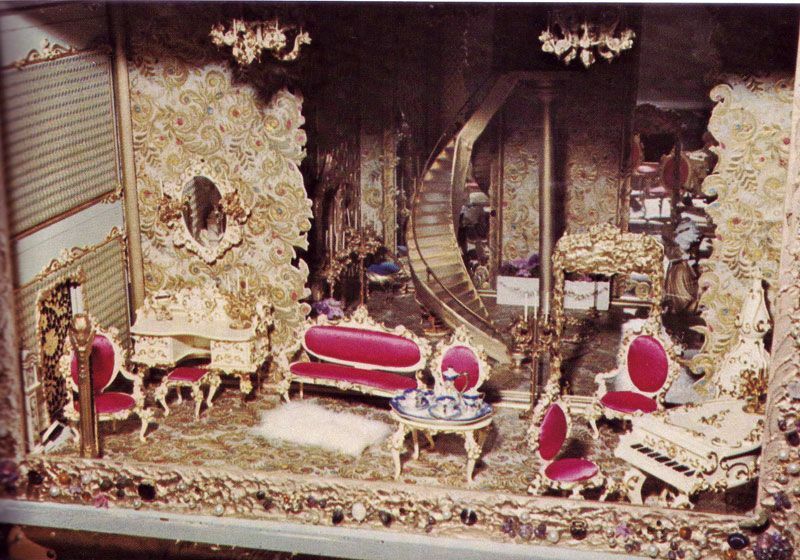 She hated furniture for furniture, jewels for jewels, precious stones as stones. She was a connoisseur by intuition." Well said, M. Mille. We could all learn a thing or two from Coco. 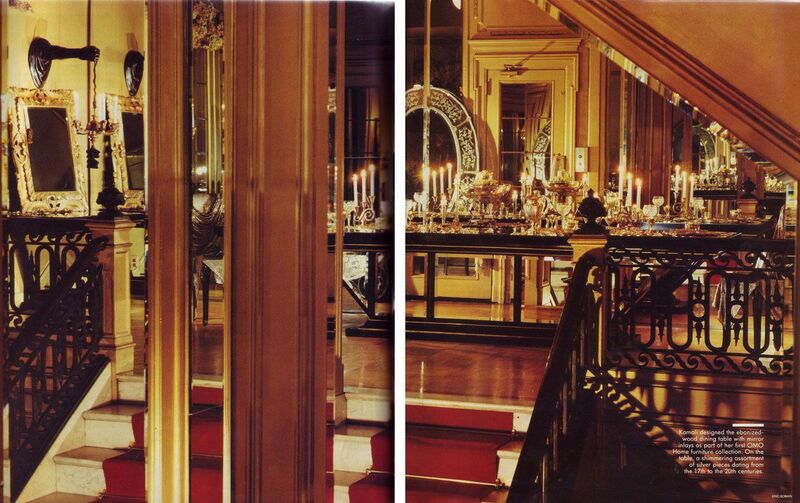 Scans of Chanel's interiors from Architectural Digest Celebrity Homes, 1977. I've been thinking a lot about crystal lately. 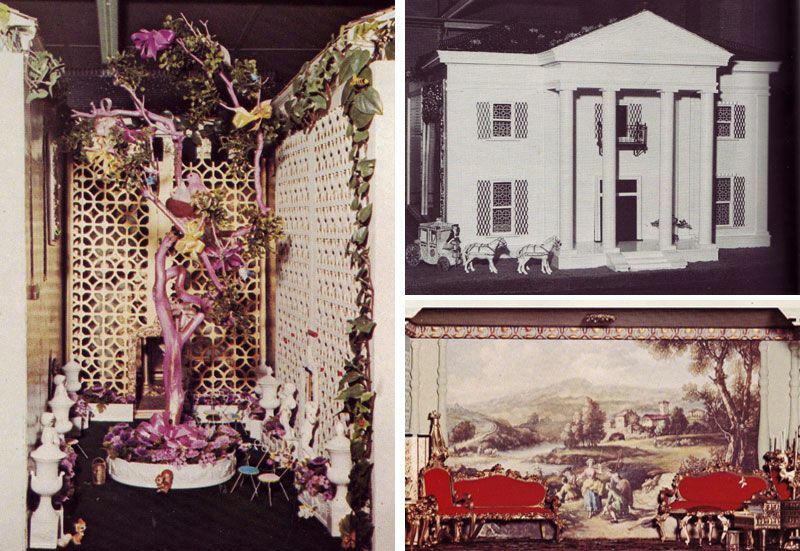 Coco Chanel had a bountiful bouquet of crystal flowers atop a glass table in her Rue Cambon apartment; artist Florine Stettheimer had one sitting beside masses of cellophane drapes, overlooking a grand view of Bryant Park. How lovely would a crystal jungle be? One full of daisies and daggers, delicate and dangerous at the same time. Maybe not quite as cloyingly feminine as the Coco or Stettheimer bouquets; rather, a tension between masculine and feminine. 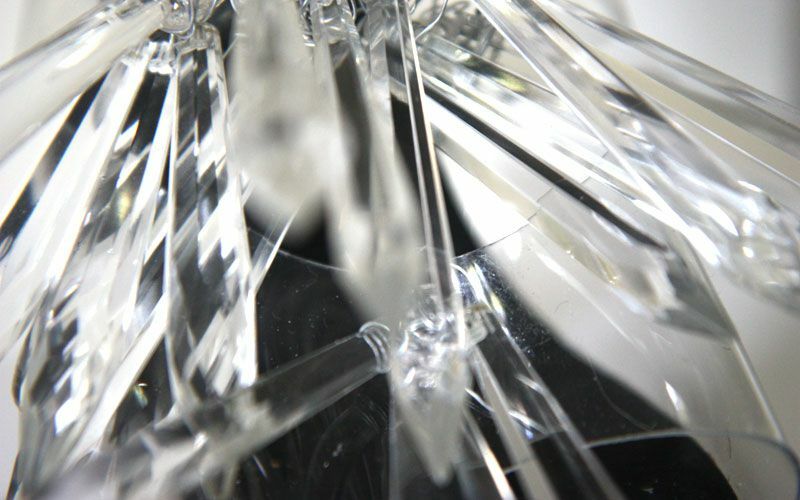 Crystal lends itself to this sort of contrast, don't you think? 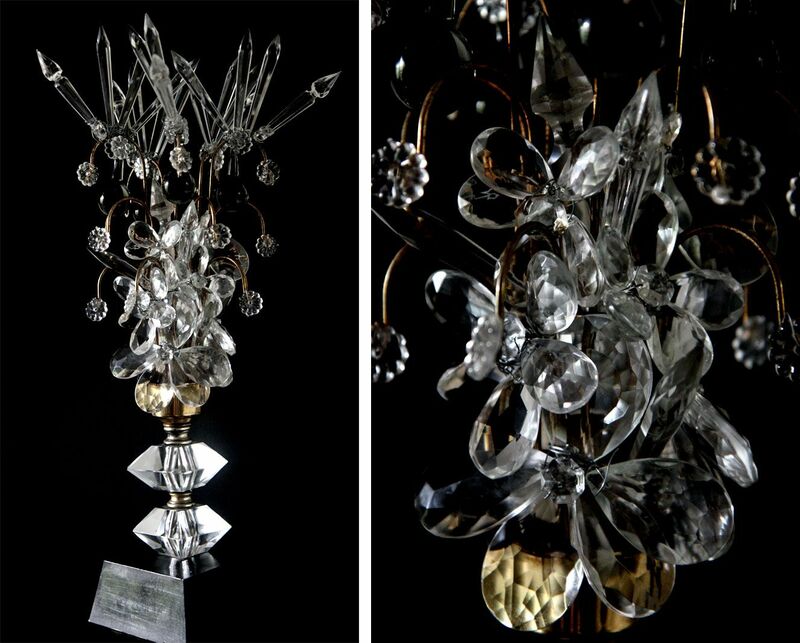 This piece is a set of lamps, formerly sparse wire structures with bare, exposed bulbs planted directly at the center— stripped down skeletons of flowers in their own right. I wrapped and encased them with my own sort of crystal bouquet. 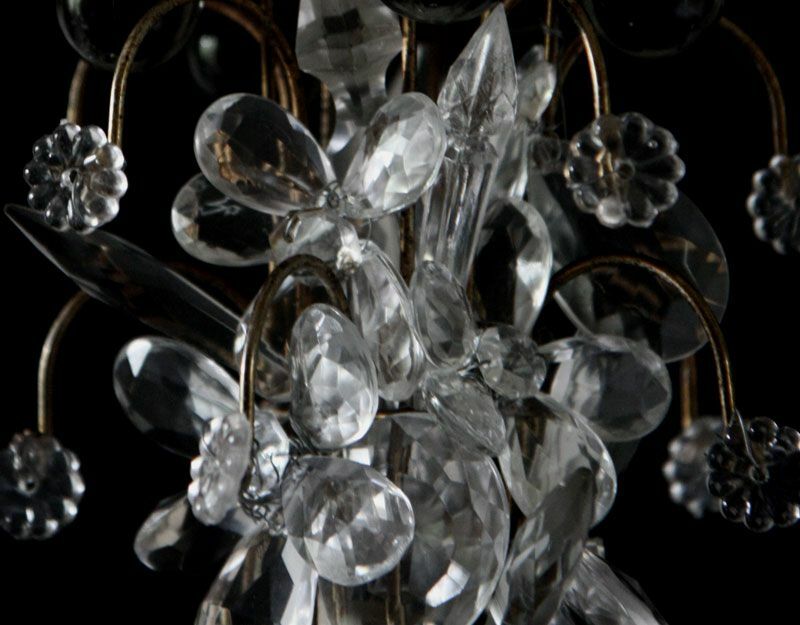 Ideal, because it softens and splinters the light from the formerly exposed bulbs, which hide behind the mass of crystal flowers growing up the lamp shafts. Lamps were created, photographed and edited by Lauren, click to enlarge. For someone who doesn't like plastic, I've been embracing it with awful gusto lately. 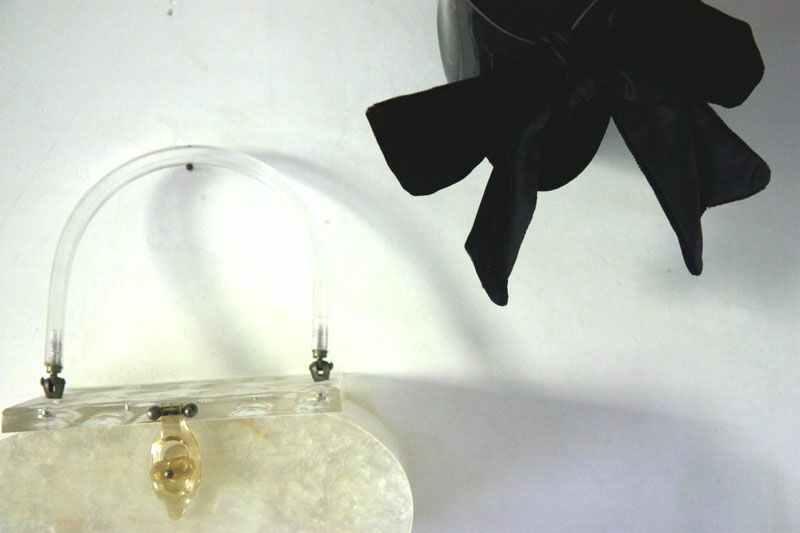 Antique Lucite Purse, Plastic Stripper Shoe with Bow. 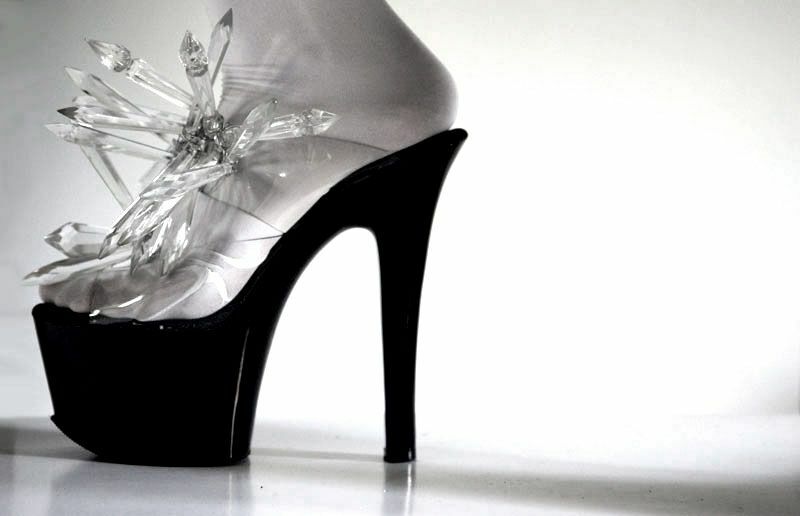 Today, it occurred to me that I would like nothing better than to see crystal spears grow from my feet. Created, photographed and styled by (In)Decorous Taste.